The one motorcycle gear question I get asked most often is: How do I keep my hands warm in the winter? For a long time, my answer was simple — I didn’t. I gritted my teeth through the cold, layering my all-season gloves with tight, mobility-reducing liners. Heated gear or grips were out of the question — my KZ’s old-school charging system could never have handled it. But now, I have my FZ-07, and last November, I hit the chilly hands jackpot. For my birthday, despite my mom’s wariness of doing anything to keep me on the bike longer (love you, mom! ), my parents gifted me a pair of Oxford Heaterz heated grips. If that wasn’t wonderful enough, two weeks later Hippo Hands got in touch to see if I wanted to try their Rogue handlebar muffs. I couldn’t have asked for better timing. 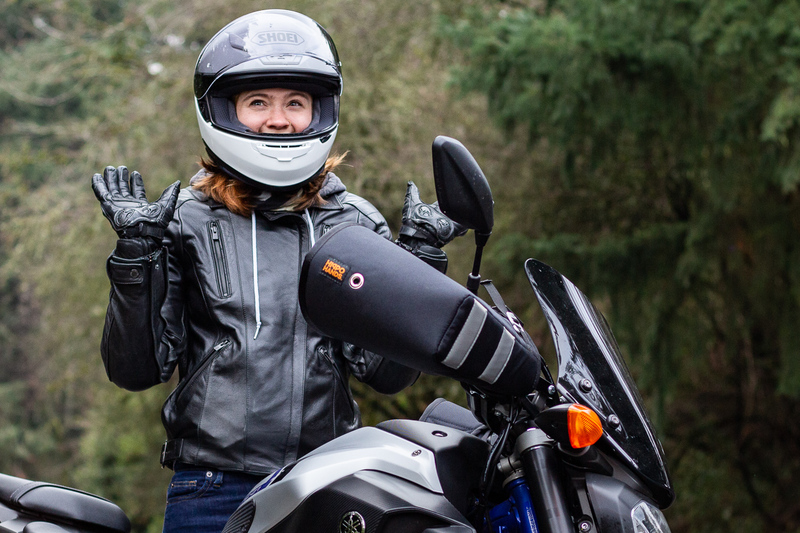 Not only was it almost winter, but I had done my research and knew heated grips and muffs worked better together — a dynamic duo of unstoppable hand warmth. I couldn’t wait to try them out. The Heaterz (mine are the sport style) were an easy install: Oxford had thought of everything. The directions were clear and easy to follow — the hardest part was getting the side cover off the FZ to route the cables to the battery. There were dummy-proof electrical connectors, a handy cut line if you needed to cut the grips to fit (I did), and velcro if you needed to stick the control box onto an existing surface instead of the mount (I did that, too). And, after watching videos of people installing older versions, it was clear Oxford had listened to customer feedback. In one video, the installer pointed out that the connections weren’t waterproof — but the connectors on my 2018 grips were. In another, the installer mentioned he wished the included mounting bracket was black instead of silver. I didn’t use the mounting bracket on my bike, but guess what — it was black. It’s always great to see a company that never stops testing and evolving their products. Clearly, Oxford is one of them. 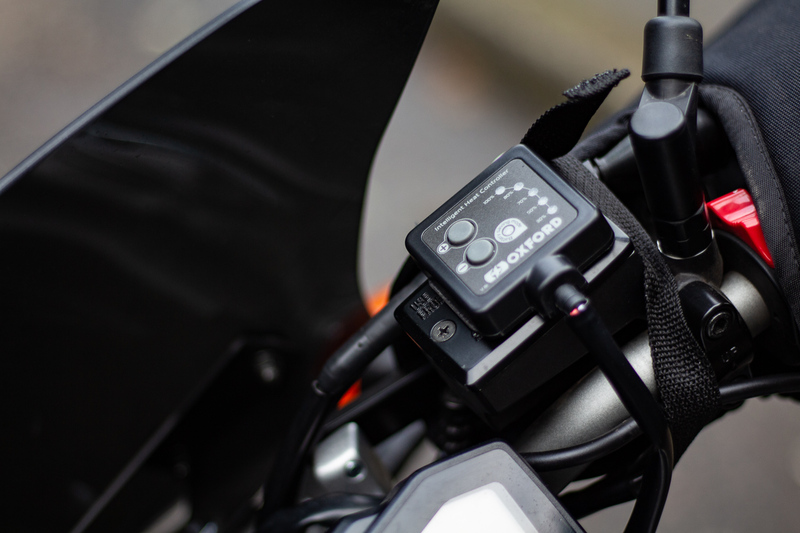 My model also has an “intelligent heat controller” to sense when the bike is off, which saves you from needing to connect the grips to a live ignition feed. I’m skittish about dead batteries, so I don’t put this feature to the test. But being able to connect the grips to the battery was definitely an easy install. I got these grips a few weeks before the Hippo Hands, so I had plenty of time to test out the grips by themselves. And man, do they get hot! So hot, I haven’t yet needed to use the highest setting. They take a minute to warm up, so I turn them on while I’m pulling the bike out of the garage. The intelligent heat controller must be doing its job, because I haven’t had a dead battery yet! I’ve done most of my testing running errands in 40-degree weather, and I found my research to be true. The grips do keep my palms warm (very warm! ), but above 30 MPH the tops of my hands start to get cold — especially my clutch fingers. Okay, so Hippo Hands aren’t the sexiest motorcycle accessory. But once you try them, you won’t care. 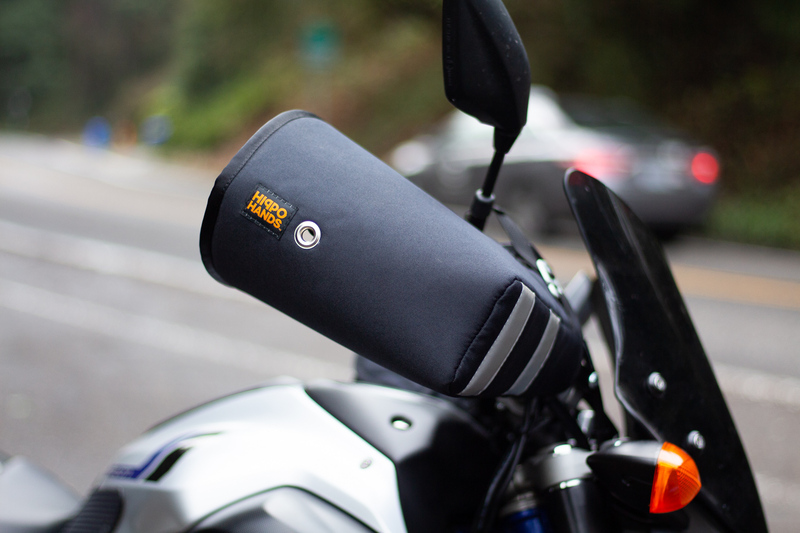 Because they work — especially with heated grips. Hippo Hands are well-constructed, made out of a stiff, lined fabric so the muffs hold their shape at speed. The ones I have, the Rogues, have adjustable straps and velcro to fit a range of bikes. If you need more serious wind protection, there’s also the adventure-focused Alcan model, which has a pull-tie closure at the handlebar instead of a strap. There are a few options with the Rogues — you can get them in all black, with reflective tape, or with windows for bar-end turn signals. Mine have reflective tape, which I love because a little extra visibility is never a bad thing! The Rogues themselves are an easy install, but there is a catch… they require brush guards. 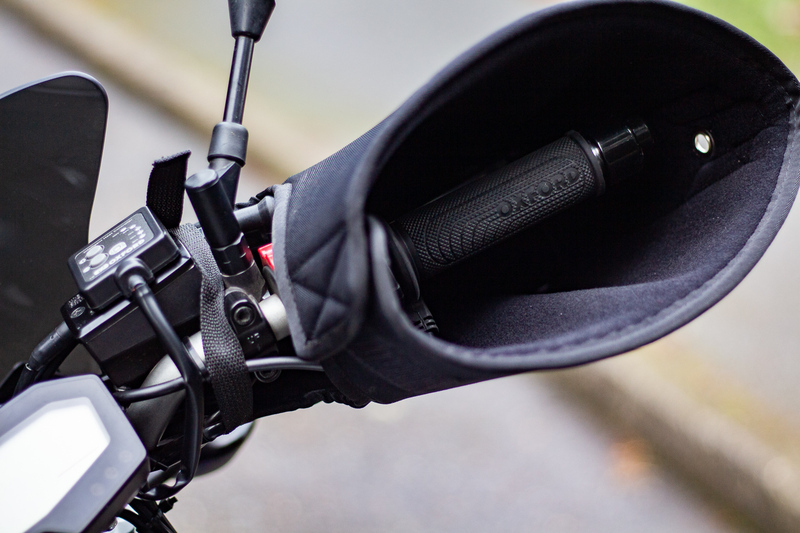 Without the support of brush guards (also known as hand guards or by the brand name BarkBusters), the muffs could push back onto your clutch and brake levers at high speeds. Oof, no thanks! Now, I’m not complaining, since Hippo Hands sent me the Rogues for free. But I didn’t think brush guards would be so expensive! Brand name BarkBusters run about $100 — for only the backbone. There are universal models for less, but of course they didn’t fit the FZ. I ended up getting an already-opened package of BarkBusters for the FZ series off Revzilla for $80. They fit perfectly and were an easy install, but it did take me awhile to come around to the expense! I thought it would be weird to not be able to see your hands while riding, but it didn’t take me any time at all to get used to it. And the spaciousness of the muffs leaves plenty of room for me to reach the turn signals and horn. So now, finally, I have the whole kit and caboodle. And guess what? I’m never going back. It’s the perfect ecosystem: Oxford Heaterz provide warmth, Hippo Hands keep it in. Now, I can run errands in 45 degrees in my regular riding gear, including my favorite Knox Coverts. But it does come at a cost: $299.80, to be precise. The Heaterz are $89.95, the Rogues $129.95, and BarkBuster aluminum backbones start at $79.90, depending on your bike. For some, it’s a small price to pay to extend their riding season. But if you have to choose between the two, I’d go with the heated grips. They’re less expensive (more bang for the buck) and make a huge difference at slow speeds. Overall, though, I’m very pleased with both the Oxford Heaterz and Hippo Hands. I can’t wait to enjoy some early spring riding with cozy, warm hands!